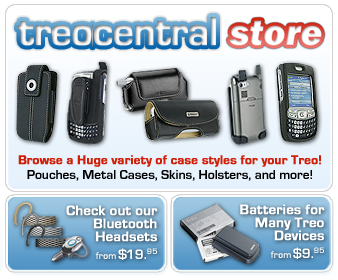 treocentral.com >> Products & Reviews >> Software >> MunduIM - like a tiny Trillian and then some..
MunduIM - like a tiny Trillian and then some.. Instant Messaging: The term is akin to Fast Food, Pay-Per- View and Microwave Ovens. We live in a world where time is limited, and the less time wasted the more money we save. Therefore, it seems only logical to hold simultaneous conversations over the Internet that don't require total focus or attention, freeing you to multitask as your hectic day to day life requires. We've also grown so accustomed to instant everything, we want instant contact with our pals. Out of this novel concept, the Instant Messaging (IM) client was born. Back in the mid-90s, I began using ICQ, an instant messaging client whose name is an oronym meaning I Seek You. Get it? Cute. When Mirabilis unleashed ICQ in 96, the IM fever spread like wildfire; instead of sending an email and wondering when (or even if) theyd read it and reply, ICQ let people shoot messages back and forth to each other from any computer they had online running the ICQ program. You could SEE when your pals were online. Back then it was all the rage, and though it remains my favorite client to this day because it allows you to send messages to people who are not on-line that they'll see when they DO log-in, (a.k.a. "store and forward").. and has numerous privacy features, the standalone ICQ has faded into the background in favor of other, more flexible clients. The number one IM app in the world presently is AIM or AOL Instant Messenger, which originated as part of the America On-Line services and later spawned into its own separate entity that is free to download and use. AOL now owns ICQ as well, which means that people that use ICQ may freely communicate with AIM users, and visa versa. Nevertheless, AIM has never and still doesn't allow that ICQ-style off-line messaging, meaning that when someone on your AIM Buddy contacts list isn't presently "signed on", you cant send them a message at all. ICQ, however, still lets you send them a message that their client displays as soon as they log in.. with a time-stamp of when it was sent. Naturally, the world loves competition, so more IM services and clients sprang up all over the place. Yahoo emerged with their Yahoo Instant Messenger (YM) soon after AIM took off, and Microsoft was close behind, as they always are, offering yet another one, which they dubbed MSN Messenger, that is in many ways inferior to all the other clients, but is (of course) included with every installation of Windows. I've found that both YM and MSN are broken in some way, or have crippled features, and few of my friends use them. For example, YM seems to have a natural ability to lose its Internet socket connection, kicking you off their network (Annoying!) at inconvenient times and when you reconnect, it closes all open chat windows, whereas MSN is the typical silly Micro$oft product. Just a way of saying, were the big boys, that has no advantages over AIM or ICQ. Still, a handful of my friends insist on using only MSN, so I have to use a multi-service client on my laptop AND my Treos if I want to shoot IMs back and forth with them. Lastly, one of the newest entrants to the explosion of IM clients is the Jabber network, the only client developed around a totally open standard, with tons of free or open source clients, but nowhere near as popular as the alternatives, and now even Google has joined in the foray with their GTalk service. Confused yet? Luckily, most of these IM services have PalmOS Treo compatible versions. AIM, for example, has been available for the Palm platform for years, and used to be completely free, though now AOL wants you to feed the kitty a little and charges a fee to download it. If youre resourceful, you can still find copies of it on the Net in various places freely, though they may be older, buggier versions. There are also mobile versions of other messaging clients, but most of them are lackluster and many of the more robust features of their grown-up (desktop) cousins are mysteriously absent. Add to that, most of the Palm versions are ancient enough that the Treo 300 is newer than they are, and you come up with a net result of programs that run as well on your Treo as water does, uphill. The real problem with so many IM services and clients is that nobody uses all of them, and many of the people youll get to know over the course of time will use only one service, meaning that youll have a plethora of people all using different services. This predicament in non-unification leaves you holding the bag. Do you choose one client and tell people who dont use it to stuff it when they want to talk to you on-line, or do you bite the bullet and run each and every client out there to keep in touch with everybody? The simple way to handle this dilemma is to run one client that handles all of the services at once. Impossible, you say? No, actually there are several such IM programs out there. For Windows, I use Trillian, which is one application that talks with the four most popular IM services, specifically AIM, ICQ, YM and MSN. It's a feature-packed program that keeps a list of all of your contacts on the services to which you subscribe, saves log files of every conversation you have with everyone, so you can later retrieve and review to point out to your friends and associates when they come back to you and tell you, I never said that.. Then you can proudly offer evidence to the contrary and feel superior for doing so. Trillian runs on my laptop 24 / 7. If you want a Trillian-like experience on your Treo, you can come pretty close to it. There used to be more than one, but unfortunately, the original multi-client PalmOS app, VeriChat died a horrible death when Nokia bought out IntelliSync and killed it off. Although very powerful, one irksome thing about VeriChat was that unlike normal IM clients, you had to pay a pretty hefty annual subscription fee to use their servers after you bought and installed the program, so if you failed to pay your dues, your services were shut off and the VeriChat program did nothing but nag you to fork over another pile of dough. Whats so special about using IM services on your connected Palm? Most cell phone carriers provide Short Message Service (SMS) thats functionally similar to IMing, but many limit you to a hundred or so SMS messages a month, then start dinging you for each message if you go over, or simply charge you a set price per message, or require an additional SMS Plan entirely. Cell phone carriers love to up-sell you into every option you add to your plan. Remember when dialing 411 to get someones number was free? Now they hit you a buck or more for the pleasure, but thats another rant. VeriChat was unbelievably rich in features, and a total gas to use. Since ICQ and AIM link your buddies to your existing accounts, if you have them, your friends instantly appeared on VeriChats buddy list as soon as you connected. No need to tediously enter them all over again or try to remember what their AIM nicknames / handles or ICQ numbers were. Of course, you could add new people, delete existing ones, block unknown folks, set up all kinds of alerts and automate many tasks. Now that VeriChat is dead and buried, the only alternative is the ever increasingly popular app, Mundu IM from Geodesic. Mundu's like VeriChat in that it allows you to connect to the full scope of IM services, including AIM, ICQ, Yahoo Messenger, GTalk, Jabber and MSN, and keeps track of your contacts, but unlike is deceased cousin, once you buy it, its yours for life. No dues, no hidden or yearly bloated fees, charges or vigorish required. Installing MunduIM is a breeze, since Geodesic distributes it as a PRC file, which means you can slurp it down over your wireless Internet connection directly from their website. Once downloaded to your Treo, just tap the installer to expand it and it does the work all by itself, finally settling down to one program file (650KB) and ten library files (384KB) for a grand total of 1,034KB, all of which MUST reside in your Treos internal RAM. Sadly, as huge as it is Mundu cant live on your SD card. For some unknown reason, Mundu will not (yet) run on the Sprint or Verizon Treo 755p, though Geodesic is working on fixing this, and I hope they hurry up and do. A shiny new blue 755p just replaced one of my 700ps last month so now I have one of each, but Mundu's only on the latter. Once Mundu's installed, youll want to configure it for your existing IM services. Unfortunately, you cant create new accounts for any messaging service with Mundu itself; youll have to set those up on your real computer, unless of course you already have accounts set up, in which case you can immediately use them with Mundu, if you can remember all of your passwords. The first time you run Mundu it prompts you to set up all of your accounts and services, so have your AIM screen names, ICQ numbers, e-mail addresses, and assorted passwords and magic lucky charms handy for this procedure. Youll also spend some time here configuring how Mundu handles your Internet connection and presence indicators (e.g. whether you want it to work in the background) as well as what name it displays in the chat windows. You also have the opportunity to enable alerts. If you desire, Mundu can emulate a fire truck with annoying sounds, rumbling vibrations and pop-up alerts every time you get an instant message, though after a while you'll likely get quite sick of all the noise. I chose to have my Treo vibrate, as of all the choices it is the least intrusive from those I could select. After configuring all its myriad prefs, Mundu deposits you at your buddy list screen and spends a little time discovering your contacts and sorting them out. It has a lot of display flexibility here: you can opt to sort your Buddies either by service or by name, and sort them into groups to manage more easily. You also have the choice to push contacts who are currently on-line all the way to the top of the list so that you wont have to fish through a ten page long menagerie of names to find out if one of your pals is signed in, but instead, you'll see them right on the top of the pile.. my preferred Mundu "Buddy" arrangement..
Mundu does have a users manual (but you must download it separately), which is useful reading, as it gives systematic directions on how to set up and use every feature of the application. If you're already an experienced IM monger on your computer, though, configuring Mundu is really a piece of cake. Still, read the manual at least once. Not *everything* about this program is totally obvious. Once you get to the Buddy / contacts list, you will immediately notice Mundus modern and very stylish GUI. One of its shining points is that it utilizes a tabbed interface, so it keeps separate chats open, each with an associated file folder style tab in the browser bar. This allows you to have multiple chats going at once, which you may switch between with a single tap. Begin a conversation and youll immediately spot a familiar sight: The traditional dual-windowed messenger screen with frames for typing and for the chat transcript, below which is a toolbar for font weight, style and color control. Additionally there are buttons to insert a Quick Text message from the built-in (editable) list of short phrases such as "Im busy right now or "let's do lunch! ", initiate a multi-person IM conference, sprinkle in some smiley emoticons or send a file. File-sending via Mundu on a Treo uploads the file to Mundus servers and then sends a familiar-looking "http://" hyperlink in the IM window that your buddy can just tap to download or view the file. You can send any photo, video, PRC (program) or PDB (database) file in this manner, which works with any messaging client, as it does not need to follow any special peer-to-peer protocol. This means that if your friend is running Trillian, AIM, iChat, etc., they never have to worry about compatibility with Mundu. Its file transfer method just works with everything. Instant messaging through Mundu is smooth sailing and you can use your web browser, SMS client and Mundus services all at the same time, though lamentably you cant send or receive IMs when you are talking on the phone as PalmOS Garnet's lame multitasking isnt capable of running phone and web connections simultaneously. Mundu has a preference pane for everything from Proxy settings to Alerts to how often to gas up your car. The most useful, of course, are the buddy / contacts options, where you config how Mundu displays your contacts, how it groups them and so on. The Alerts panel controls its more esoteric bells and whistles, and you can even opt to tell it to automatically log in and log out at a specific time, during which Mundu takes over and signs onto your services without the need of your direct input. An interesting feature and not even Trillian can do that! Along the same lines, you can also tell Mundu how to behave when in background mode, and whether to keep the internet connection perpetually alive or to keep it active and set your status (which other people see in their buddy lists) as Away. Furthermore, like Trillian or iChat, you can tell Mundu to keep a log (transcript) of all of your chats, which you may later retrieve for some stern finger waving. Would you recommend mundu Interoperable Messenger (IM)?